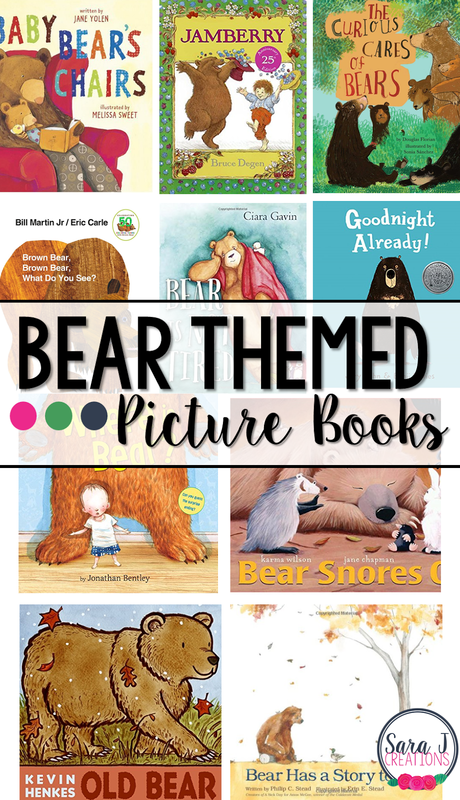 Preview: A list and description of fiction picture books all about bears. Perfect for a study about bears or a study of the letter B. While we are focusing on letter B activities this week, bears became a word that came up a lot. And it just so happens, library story time had a focus on bears this week, too. Perfect timing. If you are studying the letter B like us, or just want to focus on a bear study, check out some of these Bear Picture Books. One of the books in the series of The Bear Books, Bear Snores On shows what happens as bear hibernates all winter. His friends come to warm up in his cave but he still doesn't wake up. There are several books in this series that all center around the adventures of Bear. This classic is a FAVORITE at our house. This book has repetive text and picture clues that help even the youngest reader begin to pick up on the patterns and "read" the book. Each page shows a different silly colored animal that the brown bear sees. We enjoyed this book at library story time this week. It is all about a family of bears and their adventures doing all of their favorite things throughout the seasons until it is time to hibernate. The text is rhyming and fun to follow along. They also have versions of this book with other animals. In this bear story, Bear is ready for bed. He is exhausted and just wants to sleep, but his neighbor, Duck, has other plans. He is energetic and persistent and all he wants to do is play with Bear, making for lots of funny scenes. By the same authors as A Sick Day for Amos McGee, Bear Has a Story to Tell is all about Bear finding his friends one by one to try to tell them his story. They are all getting ready for winter and are too busy to listen. After months of hibernation, he wakes up eager to tell his friends his story only to realize he has forgotten it. Kevin Henkes is one of my all time favorite children's authors. I remember when this book came out and it was such a departure from his normal mouse story books. This is a great book for introducing hibernation and the seasons. As Old Bear sleeps, he dreams of being a cub and what he did during each season. He wakes to find it is actually spring, similar to what he dreamed about. This is a cute bedtime story that has rhyming text and cute illustrations. Baby Bear is the smallest bear in his family and he sees Mama and Papa staying up late in their big chairs and big brother gets to play games in his middle sized chair. Baby Bear causes trouble in his tiny chair but finally finds a perfect chair at the end of the day. This book will seem very familiar to parents and children and might remind them of their own bedtime routine. Bear does everything with his duck family, but when winter comes he is supposed to hibernate. He doesn't want to miss out on any of the fun and tries to stay awake. Sound familiar?? This is a funny book with a surprise ending. It is all about a little boy who is searching everywhere for his missing bear. Picture clues give away what you think is happening until the ending comes and surprises you with who the characters really are. In this classic book, a boy and a bear set off on a berry picking adventure. The words include silly rhymes and a musical beat that make it fun to read aloud. Kids love finding out what happens during their berry adventures.